Each anxiety disorder has different symptoms, but all the symptoms cluster around excessive, irrational fear and dread. Panic disorder is a real illness that can be successfully treated. It is characterized by sudden attacks of terror, usually accompanied by a pounding heart, sweatiness, weakness, faintness, or dizziness. During these attacks, people with panic disorder may flush or feel chilled; their hands may tingle or feel numb; and they may experience nausea, chest pain, or smothering sensations. Panic attacks usually produce a sense of unreality, a fear of impending doom, or a fear of losing control. A fear of one’s own unexplained physical symptoms is also a symptom of panic disorder. People having panic attacks sometimes believe they are having heart attacks, losing their minds, or on the verge of death. They can’t predict when or where an attack will occur, and between episodes many worry intensely and dread the next attack. People with obsessive-compulsive disorder (OCD) have persistent, upsetting thoughts (obsessions) and use rituals (compulsions) to control the anxiety these thoughts produce. Most of the time, the rituals end up controlling them. Post-traumatic stress disorder (PTSD) develops after a terrifying ordeal that involved physical harm or the threat of physical harm. The person who develops PTSD may have been the one who was harmed, the harm may have happened to a loved one, or the person may have witnessed a harmful event that happened to loved ones or strangers. Social phobia, also called social anxiety disorder, is diagnosed when people become overwhelmingly anxious and excessively self-conscious in everyday social situations. People with social phobia have an intense, persistent, and chronic fear of being watched and judged by others and of doing things that will embarrass them. They can worry for days or weeks before a dreaded situation. This fear may become so severe that it interferes with work, school, and other ordinary activities, and can make it hard to make and keep friends. A specific phobia is an intense, irrational fear of something that poses little or no actual danger. Some of the more common specific phobias are cantered around closed-in places, heights, escalators, tunnels, highway driving, water, flying, dogs, and injuries involving blood. Such phobias aren’t just extreme fear; they are irrational fear of a particular thing. You may be able to ski the world’s tallest mountains with ease but be unable to go above the 5th floor of an office building. While adults with phobias realize that these fears are irrational, they often find that facing, or even thinking about facing, the feared object or situation brings on a panic attack or severe anxiety. Specific phobias respond very well to carefully targeted psychotherapy. When my problems were at their worst, I’d miss work and feel just terrible about it. Then I worried that I’d lose my job. My life was miserable until I got treatment. People with generalized anxiety disorder (GAD) go through the day filled with exaggerated worry and tension, even though there is little or nothing to provoke it. They anticipate disaster and are overly concerned about health issues, money, family problems, or difficulties at work. Sometimes just the thought of getting through the day produces anxiety. 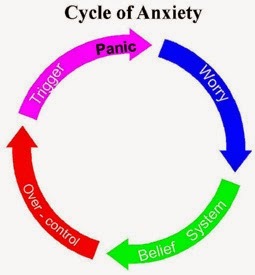 Cognitive-behavioural therapy (CBT) is very useful in treating anxiety disorders. The cognitive part helps people change the thinking patterns that support their fears, and the behavioural part helps people change the way they react to anxiety-provoking situations. For example, CBT can help people with panic disorder learn that their panic attacks are not really heart attacks and help people with social phobia learn how to overcome the belief that others are always watching and judging them. When people are ready to confront their fears, they are shown how to use exposure techniques to desensitize themselves to situations that trigger their anxieties.